Are you frustrated with your lead generation plugin for WordPress? Are you wasting time keeping the plugin updated when you really need to spend that time making sales? In this case study, we’ll discover how Crush Empire generated moved to OptinMonster from a clunky plugin, saving time and generating over 460 sales in one year. 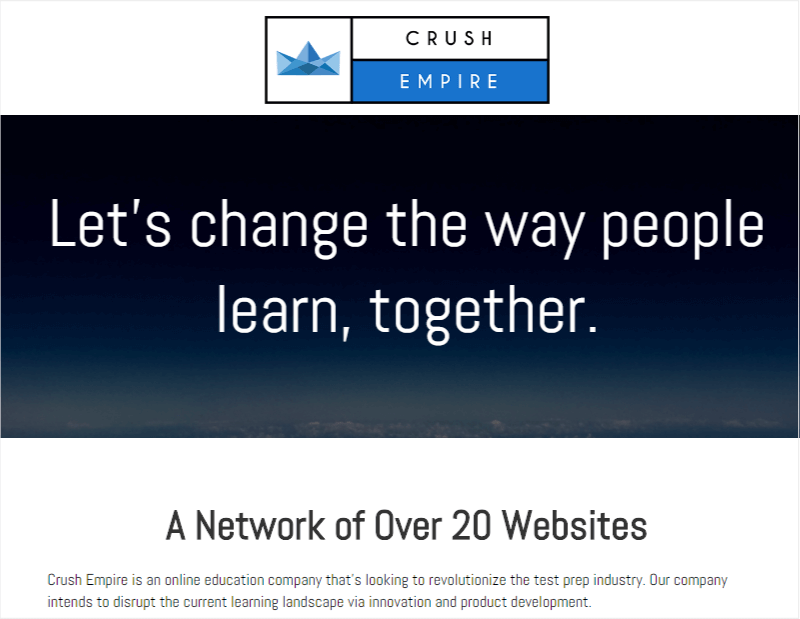 Crush Empire is an online education company looking to revolutionize the test prep industry. Some of their flagship products include Crush The CPA Exam, Crush The LSAT Exam, and Crush The Financial Analyst Exam. Crush Empire’s portfolio includes over 20 test prep products similar to these, and they use OptinMonster on over a dozen of those. Director of Marketing and Operations, James Edge, talked with us about how OptinMonster saves them hours of time every month and has led to nearly 500 sales. Before using OptinMonster, Crush Empire used a variety of WordPress plugins designed to capture leads, but with mixed results. Though each plugin offered the basic capability of capturing an email address, that’s where their usefulness stopped. Capturing a lead is only the beginning of what OptinMonster does. James said the plugins he had used only tracked clicks, but didn’t show conversion rates or integrate with Google Analytics. He found it difficult to make informed business decisions using those limited stats. In addition, James was frustrated with constantly needing to update the WordPress plugins, and troubleshooting conflicts after WordPress updates. Click stats would disappear, pop-ups and headerbars didn’t display correctly on our sites. This took our focus off optimization and new campaign creation, constantly fixing the broken plugin or design flaws. With OptinMonster we don’t have to worry about any of that. With so many websites under their control, managing 20+ separate WordPress plugin installs quickly became unwieldy. Every time they wanted to launch a campaign, they’d spend 15-20 minutes per site, logging in, recreating the campaign and then launching it. There was no way to copy the campaign from one site for use on another site, so it had to be done manually. That’s FIVE HOURS just to launch one campaign across all their properties. Then the cycle would begin all over again if they needed to make any changes to those campaigns. At OptinMonster, we know your time is valuable. That’s why we make it easy for you to both create optin campaigns, and to make decisions about their results. Every challenge James had using a WordPress plugin is solved using OptinMonster. OptinMonster can be used on any HTML website (including but not limited to WordPress) and optins can be assigned to multiple domains. Duplicating a campaign is as easy as clicking a “Duplicate” button. Optin impressions and conversion analytics are displayed right in your OptinMonster dashboard, along with more detailed stats available in Google Analytics. Crush Empire uses OptinMonster to drive customers to their specials and discounts from their heavily trafficked content pages. Many of their campaigns offer a huge discount on an already costly profession exam prep course, and redirect the visitor to that website to purchase. For every person who purchases an exam using their link, they receive a commission. To help drive traffic to the prep course websites, they created a series of optins for every type of exam they offer. They replicate that series every time they offer a new exam. The lightbox below appears only to new visitors reading a review of the Gleim CPA Course. The optin can appear either when the visitor has scrolled 50% of the page, or using our Exit-Intent technology when their mouse motions towards the browser bar. The first trigger targets the very engaged reader, while the second one targets the reader who is about to leave the page without taking an action. The optin replaces the traditional optin form with two buttons using our Yes/No feature. When clicked, each button can either redirect to another URL, close the optin, or reveal an optin form. 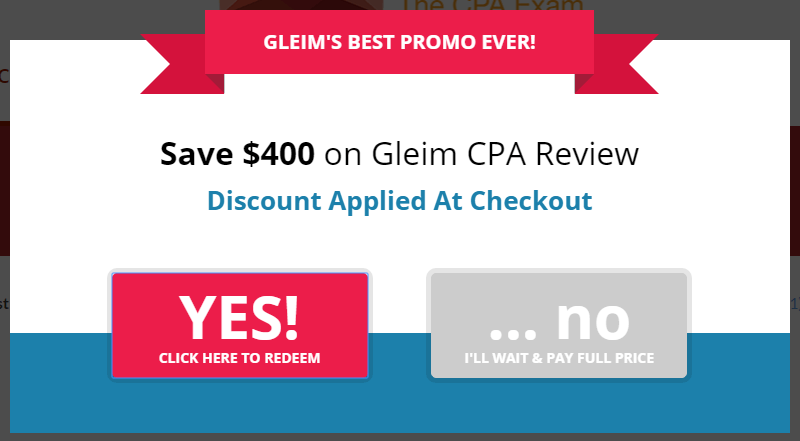 In this case, the Yes button redirects the visitor to the Gleim CPA Course website, where a special code appended to the URL automatically applies the promised discount to the cart. When the purchase is complete, Crush Empire receives a commission from Gleim. This optin converts 12.40% of visitors. They also use a floating bar optin positioned at the top of the same article to display a similar, time-sensitive offer. This optin converts 4.44% of visitors. Over and over again, on website after website, for every exam course they review, Crush Empire creates optins similar to the ones above. On some sites, the offers convert as many as 26% of visitors. Crush Empire attributes over 460 sales in the past year to their OptinMonster campaigns. Crush Empire converts between 12% and 25% of visitors using lightbox optins. Crush Empire saves five hours of time every time they create a new campaign using OptinMonster. Your time is valuable! If you’re still using a standalone plugin solution for lead generation, you’re wasting time and money managing software when you could be creating targeted, money-making campaigns. Make the move to OptinMonster today. OptinMonster is so easy anyone can pick it up and start a campaign in less than 10 minutes, if you’re not using it you’re missing out on sales. We can attribute 460 sales in the past year to our OptinMonster campaigns.